Awesome for my 5 and 2 year old! 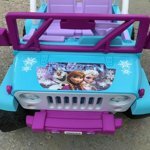 Our girls love this jeep. They both fit great and the older one can drive her sister around. It's so worth the money. It took at least 3 hours to put it together and put all th3 decals on. The frozen music from the radio is so cute. Goes pretty quick too! Highly recommend. Easy to assemble and my nieces are nuts about it!!! I was worried she would figure out the steering but had it down pat in ten mins- she's 3. 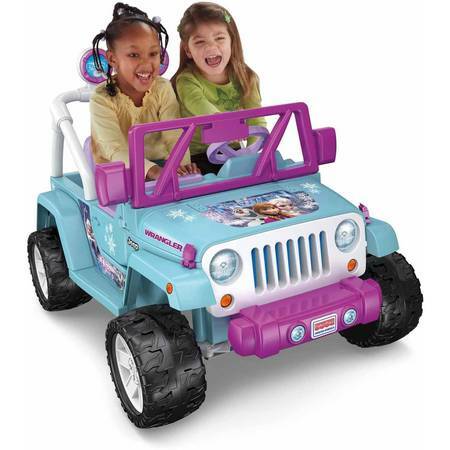 Great Jeep for kids. This was easy to assemble. I watched YouTube videos before starting. I was able to complete it in about an hour with the help of my husband. My hubby and I bought this on sale for $200 for our 2 daughters for Christmas. We have it built and ready to go in the basement until Christmas. The battery comes already charged and not an overwhelming amount of assembly. It took him about 2 hours to put together. My daughter loved this for her 3rd birthday. Very durable and worth every penny....BUT....no one tells you its in a million pieces and like 4 hours to assemble! Pay to have assembled or buy the floor model, if possible. We bought this for our daughter and it met all of our expectations. She absolutely loves it and it is so bright and colorful. The only stress we had was applying some of the stickers as they are in hard to get to areas. The worst problem we had was with the shipping. We had it shipped to a Walmart store and it was over a week late from the expected date. I bought this for my 5 year old granddaughter and was surprised at the quality as compared to others I had looked at. It is very sturdy and the plastic body is well made. It did take a long time to assemble but fortunately I read the recommendations and we did it before Christmas so it was ready. I bought this jeep 2 weeks ago for my daughters birthday present!! Ordered a Saturday came in on Tuesday!! Only downside is this take quiet a while to put together.. but I did it when kids were asleep and just a little under 2hrs!! My daughter just loves it as much as she loves frozen!!! But we have a problem and will need to wait for reimbursement to order a new one. But that doesn't change my review as that's just a little problem.. we are happy overall!! This product arrived as advertised. I am vey mechanical and it still took about 4 hours to put together. You need to go slow and study the pictures because the instructions are weak at best. All parts and tools needed were supplied. Upon completion the car worked properly and compared to others I think it was a great value. I am retired so time wasn't an issue for me.